Robert Grierson was one of five Coveanters shot in the farm yard at Ingliston on 28 April 1685 by Colonel James Douglas, Lieutenant Livingstone and their dragoons. As he belonged to Balmaclellan aprish, he was buried here. 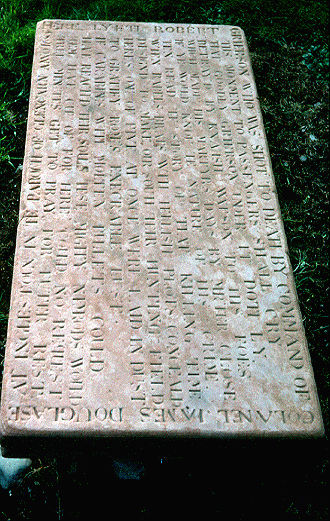 The flat tablestone to Grierson is located in the old churchyard surrounding Balmaclellan Parish Church. he stone is typical of those erected by James Paterson ('Old Mortality').